Broad spectrum heavy duty phenol disinfectant. Effective against viruses, bacteria and parasites (including eimeria causing coccidian). 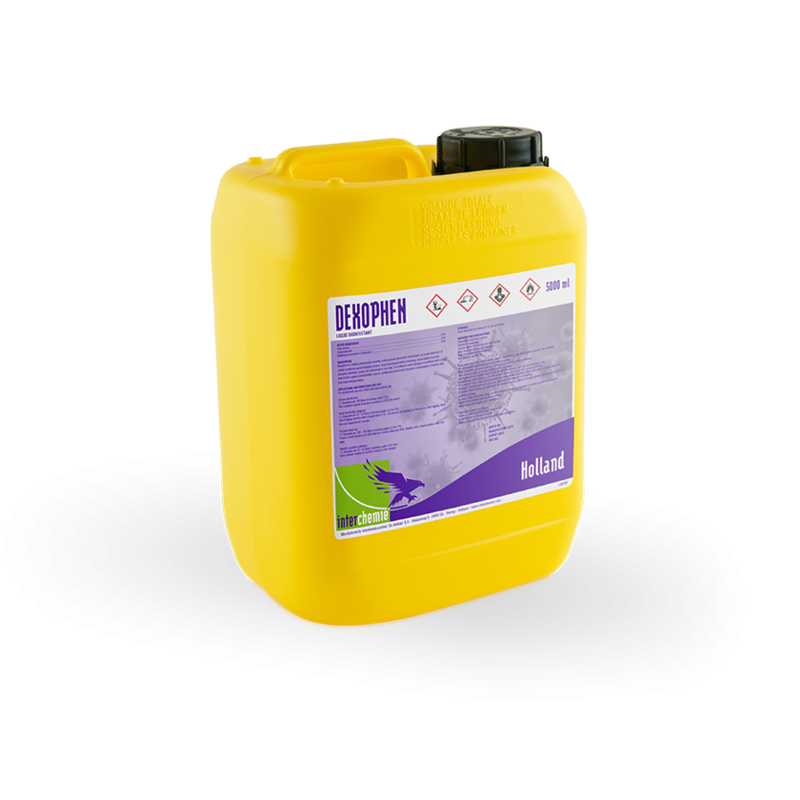 Dexophen is a highly concentrated powerful, multi-purpose germicidal disinfectant. Its broad spectrum of activity is effective against bacteria, viruses, fungi and endoparasites (including unsporulated OOcysts). Dexophen disinfects, cleans, and deodorizes in one step. It is effective in Farmyard conditions with high level of both organic (animal waste, manure, grease and grime) and inorganic contamination (mineral salts, lime scale and hard water). Dilute with water before use. Surface disinfection: 1 L Dexophen per 100 litres of water. Aerial disinfection (Fogging): 1 L Dexophen per 20-30 litres of water. Foot and wheel dip: 1 L Dexophen per 100-200 litres of water depending on organic challenge. Specific Coccidiosis challenges: 1 L Dexophen per 25-50 litres of water. - Causes severe skin burns and eye damage. - Very toxic to aquatic life with long-lasting effects. - Read the package leaflet before use. - Wear protective gloves/protective clothing/eye protection/face protection. - Do not breathe mist/vapours/spray. - In case of inadequate ventilation wear respiratory protection. - If in eyes, rinse cautiously with water for several minutes. Remove contact lenses if present and easy to do. Continue rinsing. - If inhaled, remove person to fresh air and keep comfortable for breathing. Call a poison center/ doctor. - If experiencing respiratory symptoms, call a poison center/ doctor. - If on skin, take off immediately all contaminated clothing. Rinse skin with water/shower. If skin irritation or a rash occurs, get medical advice/attention. - If medical advice is needed, have product container or label at hand. - Avoid release to the environment. - Waste must be disposed of in line with local regulations. 5 L and 10 L jerrycan. 200 L drum.